15-Seconds Co-Founder Fred Francis appeared on CNN’s Reliable Sources this morning. Partial transcript courtesy of CNN below. KURTZ: The remarkable uprising in Egypt unfolded on our TV screens day after day, but the situation in Libya darker, more dangerous, and much harder to cover. Most Western journalists have not been allowed into the country, although some, led by CNN’s Ben Wedeman and NBC’s Richard Engel, have made their way in. What they have found is very ugly. KATIE COURIC, CBS NEWS: Libyan dictator Moammar Gadhafi vowed today to fight to his last drop of blood. BEN WEDEMAN, CNN SR. INTERNATIONAL CORRESPONDENT: Well, we’re hearing — I mean, it’s very hard to get real reliable figures, certainly when it comes to the situation in Tripoli. We’re hearing, for instance, that bodies of people who were killed in those protests, in Tripoli, are being taken out of the morgues and being buried on the beaches to conceal the actual death toll. RICHARD ENGEL, NBC NEWS: From Benghazi, this is the unofficial capital of the rebel movement. The city is now being administered by the rebels themselves, and people here say Tripoli next. KURTZ: So how has the banning of most Western journalists changed the coverage and our perception of what’s happening in Libya? Joining us now, Fred Francis, former national security reporter for NBC News and the co-founder of 15Seconds.com. And in New York, Rachel Sklar, editor-at-large for Mediaite.com. Fred Francis, it’s got to be extraordinarily difficult to report in a country where there’s a shooting war going on, where you’re not being allowed in. The regime considers journalists to be there illegally. And, in fact, just the other day, Gadhafi said that any journalist who hadn’t been given permission to come into Libya would be considered an al Qaeda collaborator. What message did that send? FRED FRANCIS, FOUNDER, 15SECONDS.COM: Well, I mean, this is a display by American journalists and others of the purist form of raw courage covering this kind of story. It’s like going down an interstate on the wrong way at night, in the opposite direction, with your lights out. You just don’t know crossing that desert what’s going to happen, and that’s what’s happening. And we have Ben Wedeman, we have Richard Engel, and some other journalists who have gone in there, not really knowing what’s ahead of them, and anything could happen. So it’s very difficult, and we’re not getting the whole story because it’s so difficult. KURTZ: Some newspaper journalists as well. And Fred, in the last couple of days, the regime seems to want to get some positive coverage. So some journalists were brought in for a tour of Tripoli, although it didn’t turn out very well for the Gadhafi government. And Christiane Amanpour of ABC was — this morning aired an interview with Gadhafi’s son, that obviously she had been allowed access. So, are they now suddenly worried about their image in the rest of the world. FRANCIS: Well, they have to let somebody in. And selectively picking Christiane Amanpour is a really good thing for them to do, the only good thing that they’ve done. But frankly, this is the kind of coverage that makes careers, and nobody is trying to make a career here. They are just trying to stay alive. You’ll notice that nobody has gone from Benghazi, Ben Wedeman or Richard Engel, to Tripoli. It’s too dangerous a trip. KURTZ: I think they would like to. FRANCIS: They would like to. It’s just too dangerous. KURTZ: Well, I predict they will get there. Rachel Sklar, for the most part, we’re not seeing journalists, even those that have gotten in, interviewing protesters in the street and providing those kind of pictures. How is the lack of that kind of video affecting the coverage, in your view? RACHEL SKLAR, EDITOR-AT-LARGE, MEDIAITE.COM: Well, there isn’t that much of a lack of video, actually. You know, people on the ground in Libya are using YouTube as a tool to get their images out. And I’ve read reports of people smuggling, like, information cards between protesters and refugees to get out of the country so that they can do it — not only upload those images into the cloud, but actually having them transported physically. And the upshot being that they are managing to get snippets of video out and up, and out into the world. So we are definitely seeing, no question, the value of YouTube. KURTZ: But even with that YouTube presence, is there less of a sense, certainly compared to Egypt, of a citizen uprising, and it’s being portrayed perhaps more as a civil war between two armed camps, and doesn’t have any of that sort of romance that got Americans glued to their sets during the revolt in Egypt? SKLAR: You know what? It’s not meant to be romantic. People are dying. Gadhafi is firing on his own people. It’s brutal. One of the main comments that came out about Egypt was the remarkable lack, comparatively, of violence in that situation. And, you know, alas, like you said at the beginning, this is much darker. This is an authoritarian dictator doing every thing he can to hang on to his power. This his son saying, like, Plan A, Plan B, Plan C is to live and die in Libya. I mean, there’s really no other way to slice it. This isn’t romantic. This is a brutal, authoritarian regime. FRANCIS: Yes, nothing romantic about this. The fact is that this is going to get a lot more dangerous before it gets over for American journalism. We are going to see more bloodshed in the streets. He’s not going to — I remember interviewing him 20 years ago, and he was glassy-eyed at the best of the times. I can’t imagine the kind of situation that journalism has to face going against his people, his generals right now, trying to get into Tripoli, which, of course, they will try to do, as you say. FRANCIS: But it will be the most dangerous chapter in what we’re seeing. KURTZ: If I realized you had interviewed Gadhafi, I would have led with that. Let me turn now, Fred, to this “Rolling Story” by Michael Hastings. He, of course, the reporter who essentially cost General Stanley McChrystal his job by reporting those off-color remarks the general had made. The new story says that a three-star general in Afghanistan had used a so-called psy-ops unit to utilize propaganda techniques to win backing from visiting to VIPs. And my first reaction was, you’re going to brainwash John McCain and Joe Lieberman and Admiral Mike Mullen when they go to Afghanistan? FRANCIS: That’s right. This is preaching to the choir. KURTZ: That’s a very strong word. Did you say character assassination? FRANCIS: It is a strong word, but it suits this story. It shows that Michael Hastings doesn’t know anything about how a general officer runs his staff, especially in a war zone. When important visitors are coming into your — all hands on deck. This wasn’t an attempt to do psychological operations against United States senators, this was an attempt to craft and shape the message that they would hear. That’s not psy-ops. KURTZ: But it’s important to point out that the source — and I’ll throw it to Rachel in a minute — was an on-the-record source, Lieutenant Colonel Michael Holmes. KURTZ: OK. Well, on the record, and Hasting was asked about this on MSNBC. MICHAEL HASTINGS, CONTRIBUTING EDITOR, “ROLLING STONE”: I believe he finally went public with this, was because right from the beginning, he — right from the beginning, when he was first ordered to do, he had said, it’s a bad idea, it’s a bad idea, it’s a bad idea. KURTZ: So, Rachel Sklar, if your on-the-record source is saying, “I didn’t want to do this,” he’s a lieutenant colonel, and he was retaliated against, doesn’t that give you some justification to publish? SKLAR: Of course it gives justification to publish. I have to clarify what you said at the beginning. You know, Michael Hastings didn’t get Stanley McChrystal fired. Stanley McChrystal got Stanley McChrystal fired by using poor judgment in front of a reporter ongoingly. KURTZ: About whether it was on the record. And here, there is no dispute that these comments were on the record. KURTZ: Rachel, I’ve got to go to break here. So hold that thought. KURTZ: — this was to avoid hurting Ailes’ friend, Rudy Giuliani, who had appointed Kerik and was running for president. But, Rachel Sklar, we don’t even have the transcript of the phone call. We have a former Regan lawyer saying this happened. Was this worthy of a front-page story? SKLAR: I think it’s definitely worthy of a front-page story. Roger Ailes runs a very powerful network, and this would have been telling Judith Regan to lie about something to protect a potential presidential candidate who was going to get favorable coverage on his network. I think this is front-page news, just like I think the Pentagon psy-ops story is front-page news. FRANCIS: If this allegation is true — if it’s true — this gives substance to the charge that Roger Ailes is more a Republican king maker than he is a news executive. And he could be in some serious trouble if it is true. KURTZ: It is an allegation, and News Corp says that the company has a letter from Judith Regan saying that Ailes did not — quoting here — “Ailes did not intend to influence her with respect to a government investigation, didn’t release the whole letter.” So, again, there’s a lot here we don’t know. Now, on Friday, it was announced that Kathleen Parker is leaving the “PARKER SPITZER” show on CNN. It’s going to continue with Eliot Spitzer. It’s going to be called “IN THE ARENA,” with a rotating cast of panelists or co-hosts. Here is her final words on the show. ELIOT SPITZER, CO-HOST, “PARKER SPITZER”: And thank you for watching. Goodnight from New York. KATHLEEN PARKER, CO-HOST, “PARKER SPITZER”: On a personal note, today is night last day on the show, and I just want to thank you, the viewers, for tuning in. I look forward to seeing you down the road. KURTZ: Rachel Sklar, a lot of people thought it was kind of an awkward TV marriage. Was this a good solution? SKLAR: Well, they all say it was a good solution. I would have preferred to see — in light of Eliot Spitzer’s history, I would have preferred not to see his co-host, who is a woman, sort of inelegantly pushed out. But everybody is saying that they are happy about it. So, the ratings weren’t very good. So I think that what they have come up with, the new “IN THE ARENA” show, might be an improvement. But the whole thing was just uncomfortable, and it was very uncomfortable that she was given all of nine seconds to say good- bye, as my friend Glenis Pickle (ph) pointed out online. KURTZ: Kathleen Parker is a Pulitzer Prize-winning columnist for “The Washington Post.” She didn’t have a lot of TV experience going up against Spitzer, who had been a governor and used to be in the spotlight. FRANCIS: Yes. This is the most unbalanced pairing since Penn & Teller, frankly. I mean, she had no wattage. He was very, very expressive, very hard-driven. And even though she’s a conservative columnist, and a conservative writer, you never saw that fire and spark going up against Eliot Spitzer. KURTZ: In that case, I’ve got to break it in and thank you, because you’re pretty high wattage, and you’re kind of blinding us all. Fred Francis, Rachel Sklar, thanks for joining us this morning. Will Reporters Make Gadhafi Duck? 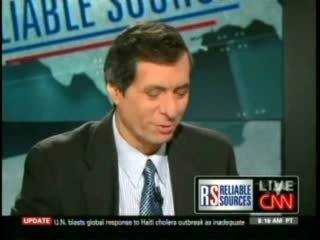 15-Seconds co-founder Fred Francis will be a guest on CNN’s Reliable Sources with Howard Kurtz at 11 AM ET on Sunday. Among the topics will be media coverage of the crisis in Libya. Fred is no stranger to reporting from war zones. When the big bad wolf invites you in for a meal — it is a safe bet that YOU are on the menu. Congressman Jason Chaffetz (R, UT) was a guest on Lawrence O’Donnell’s program, “The Last Word,” on MSNBC last night. Alisia Essig, the Congressman’s press secretary tells us that her boss was invited on to discuss the budget. She says he was blindsided when O’Donnell suddenly began to attack him. Conservatives invited on MSNBC shows — and liberals invited to appear on Fox News — should generally assume that they are present to feed the hosts’ appetites for fresh meat. Shortly after the segment began, O’Donnell started ripping into Chaffetz for sleeping in his government office rather than renting a place to live while in DC. As the video below shows (h/t Daily Caller) O’Donnell began tearing the Congressman from limb to limb — calling him a “tax criminal” and demanding to know how much his home mortgage in Utah is and whether his wife brings in any outside income. Chaffetz did a good job keeping his cool — at one point suggesting that O’Donnell got up on the wrong side of the bed that day — but the net result wasn’t pretty. Our advice to clients — know what you are getting into. Don’t believe what producers tell you the subject of the interview will be if you are going on a show whose host is known to be against most of what you are for. Do some opposition research before you go in — and be armed with material you can use to defend yourself if you come under attack. Don’t go to a knife (and fork) fight armed only with a napkin.